Autumn always seems far too short to me and as we embark upon winter, I find myself in reflection of November’s splendor. Autumn is one of my favorite life coaches, for with each falling leaf and changing color, it seems there can be found some lesson, metaphor or parable. I am most coachable during fall because it is the season that I am most hypnotized by. As the rest of the year whizzes by, fall is when I remember to pause and relish life. It is when Nature has my full and undivided attention. It is my season of pensive reflection and resolution. 1. Growth begins with letting go. 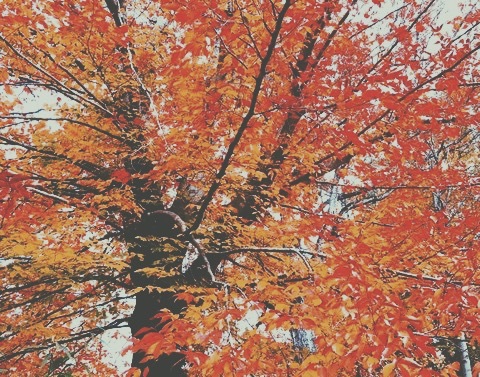 Fall shows us how beautiful it is to let go of dead things. It is in our nature to grow attached to things, but what if the trees held so tightly to their leaves that they did not let them change their colors and fly? They would have no room to grow fresh, new leaves. In their attempt to protect themselves from vulnerability and nakedness, they would forfeit their opportunity to strengthen and renew. They would be holding on to something that, regardless of whether they held on or not, would eventually crumble. Holding on may exemplify strength, that is, until it begins to weaken the host; then strength is best represented in those who can so elegantly let go. The funeral of the leaves is one of the most beautiful dances, and how courageous of the tree to strip itself bare to set them free. With each instance of letting go, the opportunity arises to strengthen, self-liberate, refresh and start over—to make room for a clean slate and to receive a harvest of something new. 2. An ending is a beginning in disguise. We should not fear nor mourn the end of one thing, as it engenders the beginning of another. Whether the conclusion is a transition upon which to build, a lesson to learn and grow from, or a new slate upon which to start fresh, there is progress in the promise that nothing old is final until it births something new. Nature does not despair at the sight of winter, nor should we in our perceived endings. These perennial phases create a resounding commentary about the opportunity, not the misperceived obstacle, within endings, as they come with intrinsic promise of new beginnings. 3. Leave your comfort zone. 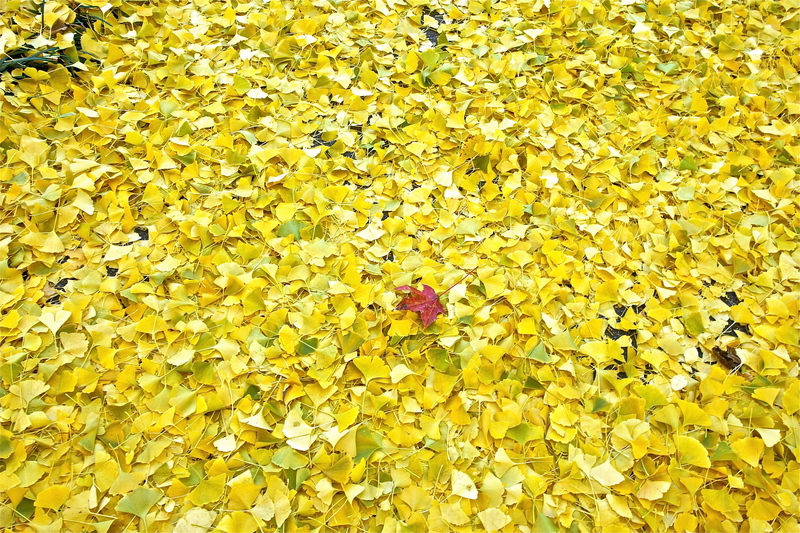 Autumn leaves display so well how beautiful life can be when you leave your comfort zone. There is a certain beauty in forsaking familiarity in favor of foreign. There is a certain freedom in forfeiting whatever may have you rooted in favor of a new adventure. There is a certain blessing to dance among fateful strangers. Sitting within the refuge of our roots is always instinctual, but there are guaranteed times when our comfort zone becomes uncomfortable— when we have no other choice but to take to the sky and fly away. Life’s pivots upon the oxymoronic truth that the only constant in life is change, and even as ritualistic and predictable as seasons are, there is inherently a degree of a awe-inspiring transformation that nature offers us by implementing a complete overhaul of scenery every three months. Upon this metaphor we can apply a blanket of universal truths: no matter what the circumstance, good or bad, hot or cold, it will change. Here lies the essence of life. A tragically beautiful, and optimistically morbid paradox upon which the world turns. No brutal heat nor frigid cold is permanent; each phase is solved by systematic and seasonal cooling or thawing, observable in nature and in life. And isn’t that great news, the ability depend on the certainty of change. Because in that promise of change, we can be assured that our circumstance is never permanent, no matter how dire our shortsightedness may find it to be. 5. Growth necessitates change and change necessitates growth. Change is the catalyst for growth. And growth the catalyst for change. The fading in and out of seasons serves as a compelling metaphor of the beauty and necessity of change and the growing pains thereof. It is such a miracle, the ability for a season to completely transfigure one scene solely through the instruments of time and temperature, decorating with snow, flowers, sunshine or golden leaves, and then for the affected to respond with such an effortless poise, always prepared to adapt to sudden and sweeping change. Many respond to change with fear or resistance, but your seasonal transfiguration should be embraced. But so often people who embrace change (also read:growth) are condemned by peers who fear it. Relationships balk under the pressures of change, when one’s growth doesn’t match the other’s. But do not yield to these promotions of stagnancy. Those who refuse to adapt become plagued with stagnancy and they will try to spread this to others. Have you ever been condemned for changing? “You’re not the same. You’ve changed. You’re different now.” These are often phrases intoned with negativity, however it is most often a compliment they don’t realize they’re giving, as well as a courteous hint that they are not intending to grow with you. Life never rewards those who conform or stay the same. Progress lives in the ability to positively and gracefully change.